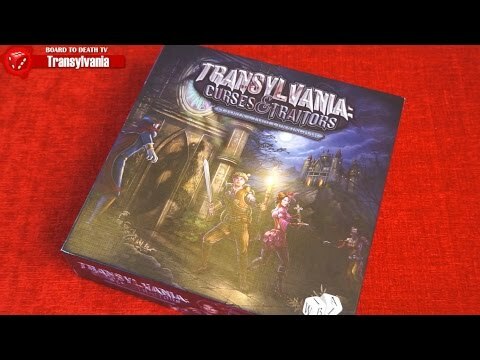 Transylvania: Curses & Traitors is a heavily themed adventure and exploration game utilizing a modular board, variable player powers, hand management, and dice rolling. Game play: The board consists of sixteen 6" x 6" tiles representing places in Transylvania such as the Church, Graveyard, and Castle. Adventurers start on the Church Tile and explore uncovering new tiles. Each tile contains token spaces which are opportunities to perform challenges of strength, mental acuity, and spiritual fortitude. A successful challenge results in the reward of a Quest card. The Quest deck contains the Knowledge cards needed to break the curse. While exploring Adventurers will also encounter Events. Failure of Events leads to injury and/or death while success leads to additional rewards. If Adventurers collect Transformation cards plus a card that activates the Transformation card, they become a Vampire, Werewolf, or Zombie. The goal of the game immediately changes from seeking Knowledge to eliminating the other players by attacking them.